Deadline for registration is Monday 15th April. Held regularly at clubs across the country, our Warrior Camps are a fun-packed, commitment-free way for females to get outside, get muddy and experience the dynamic, exhilarating sport of rugby for the first time. With plenty of help on hand, we will introduce you to the basics of rugby – passing, kicking and tackling, coupled with enjoyable fitness routines – helping you step out of your comfort zone and unearth your Inner Warrior. The next wave of the Inner Warrior Campaign will run from 10th May to 26th May. The campaign has been hugely successful to date in getting more women involved in rugby, many of whom have never had a chance to pick up a rugby ball before. Digital assets are available for download here. 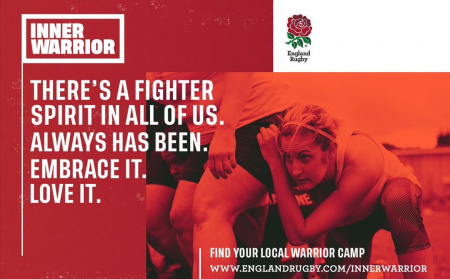 Any questions about Warrior Camps or the Inner Warrior campaign can be sent to InnerWarrior@RFU.com and make sure your club has signed up to host a camp here.